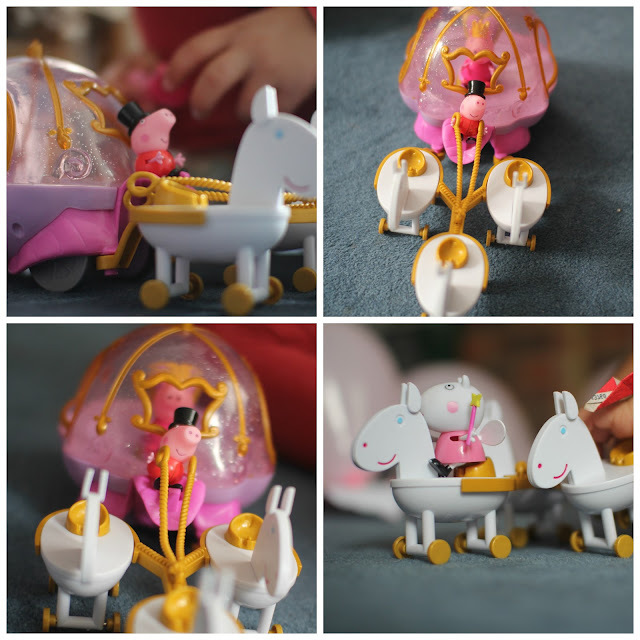 We recently received the Princess Peppa Carriage for my little ones to review they are massive Peppa Pig fans, come on lets face it who isn't even I have been known to laugh at one of Daddy pigs escapades. I just knew my princess loving Ami would be over the moon with it. The set comes with a moveable Peppa and George the carriage and three detachable horses. The little George has lots of places he can sit and Peppa can sit in the carriage like a princess. Thankfully the toy came ready assembled so once I got it out of the box it was ready to go. Another bonus is that it doesnt involve batteries meaning that children have to use there imagination to play along with it. I added some extra figures too as all the Peppa figures work in all the play sets. Ami had a lot of fun putting Sir George and Princess Peppa in there rightful places. Son Son also loved it although he kept on saying the George was Peppa because he was in the red outfit. Its very cute and every Peppa fans dream to play with. The new Peppa pig range is something well worth investing in. Its great for the children to learn through play and be creative with there stories. Its a toy that isn't too noisy and won't go off in the middle of the night too. The set retails at £29.99 and is available at Smyths toy shop. My two little ones have loved it and had been a great asset to our growing Peppa Pig collection.